Charles Hart was a lot more than your average, or even better than average, popular dance-band and male trio/quartet singer. He made his first recordings in 1915 and continued to record prolifically for numerous labels, either as a solo artist or as the member of popular vocal groups, until the end of 1923, when he turned to operatic singing and recording. In 1925 he went to Germany to study operatic singing and there sang on radio and made several records. He was back in the USA by September 1926 and though he continued to record, little of his work made use of his operatic training. Harmony was the budget issue label of Columbia and many of Hart's recordings were issued on this label. 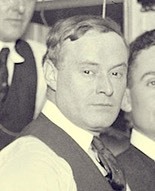 In 1929 Hart returned to Germany, effectively ending his American recording career, though he did return to the USA some five years later to sing on stage in opera and musical comedy. 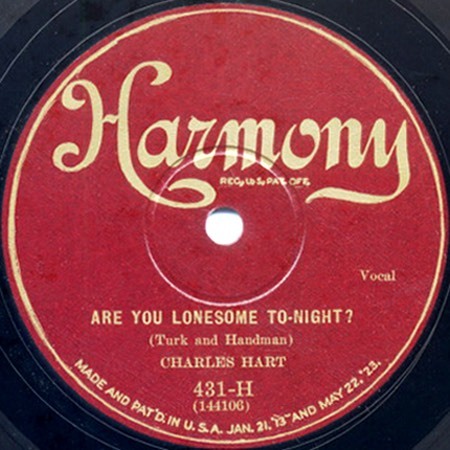 Charles Hart made the first commercial recording of Roy Turk and Lou Handman's song, Are You Lonesome To-night? on 9 May 1927. For a more complete biography of Charles Hart, see this page.